Pins on maps of all books of the game. Divided into 3 filters Unknown Lorebooks, Collected Lorebooks, Eidetic Memory. In both Keyboard & Gamepad Modes. Pins also displays if book is in a dungeon & for Eidetic Memory linked to which quest. Possibility to unlock Eidetic Memory even without doing the Mage Guild Questline. Coordinates of each book with a right-clic on the book. It will open map, zoom & set a rally point on the focused book. For Eidetic Memory, a tooltip to inform if book is in a bookshelve, in a dungeon, linked to a quest, etc. A detailled report and its copyable version in the Lore Library throught R keybind. NEW: An option to use quest books when they are received so they are never missed again. Note that it will also use maps-like quest items because the addon cannot distinguise between the different types of usable quest items. In-game setting are in the SETTINGS -> Addons Settings -> LoreBooks. You can also choose what icons you want to use, which kind of book to display on map filters or in options and much more. Please try it yourself and let me know your thoughts. All ideas how to improve this addon are welcome. It includes thousands of lorebook locations and with every update will be this number higher. If you find any lorebook not listed in database, addon will save its location and display it on the map for all other characters. Every people who contribued to improve DB throught the sharing system - Already 200 gamers share their discoveries ! - Added all Elsweyr prologue books. - Enabled miner again for a few days, still missing plenty of the new books! - Fixed error when opening Eidetic Memory. - API Bump for Wrathstone. - Miner enabled for a few days. 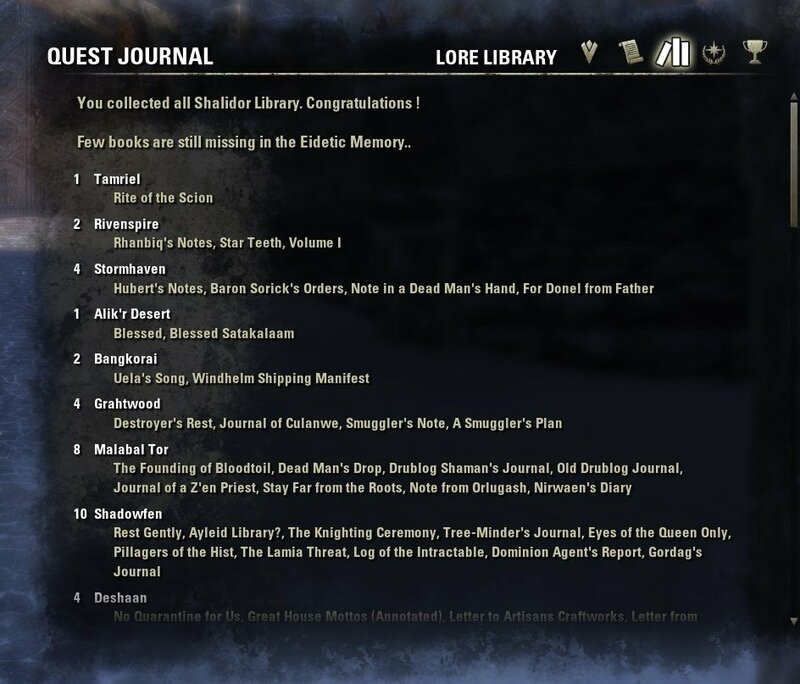 - Added missing books from Murkmire. - Fixed errors when "Unlock eidetic memory" was enabled, even if it was properly unlocked anyway. - Added most of the books for Murkmire. - Miner enabled for the next 5 days. 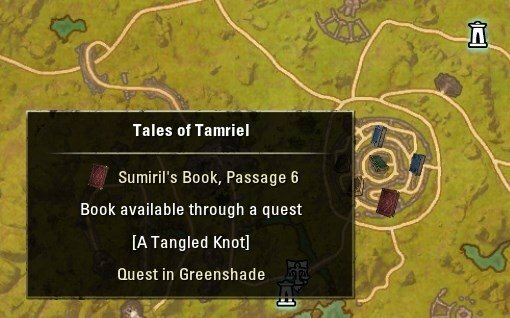 - Added books for the Murkmire prologue quests. - Another (very very late) PTS miner update. - Properly enabled miner on PTS now, sorry! - Fixed incorrect book count when emulating Eidetic Memory. - Added support for PTS and enabled miner there for a few days. Note that you won't be able to share books on PTS if you do not have Eidetic Memory. - More additions to Summerset lore books. - Fixed UI error when using the 'enable eidetic memory' setting. - Fixed a handful of books I came across. - Fixed part of the miner being active when it shouldn't be, which could lead to errors. - Fixed duplicate pins and added more bookshelves. - Added missing quests to associated Summerset books, all should have their quest linked now. - Added feature that tries to use quest books in the inventory. - Fixed case-sensitive typo in manifest. No more startup error. - Linked almost all quest books to their respective quest. - Cleaned up some bookshelves-only books from Summerset map. - Miner will once again collect quest data for books. - Added around 150 books from Summerset thanks to everyone. - Miner enabled again for 24h for remaining books or new locations. - Enabled miner for 24h, max delay is an hour. - Added 16 books added by last DLC (on 17) here and there thanks to everyone . - Few pin additions. No new books. - Few pin additions and a little bug fixed. No new books. - Enabled miner for patch 3.2.6 on Live. It will be enabled only for 25 Oct. 2017. - 12 Clockwork City books added thanks to PTS community. - Enabled miner for patch 3.2.5 on Live. It will be enabled only for 23 Oct. 2017. - Miner enabled for patch 3.2.2 & 3.2.3 on PTS only. Mining is only enabled for Clockwork City map. Data is sent after 2 books read, so please don't read too much or my PTS mailbox will be flooded. If you tend to help by reading books on PTS please update in few days. - Few books added here and there thanks to everyone. - Few books added here and there thanks to everyone (pin additions and fix on new dungeons). - Books in Trials are now displaying their correct zone. Some manual corrections will be progressively pushed due to game lack of correct values for some places. - Fixed a small tag display error for french / german clients on tooltips for losts books (books only found throught quest backpack). - Few books added here and there thanks to everyone. 10 books (on 2965) are actually missing from the DB. 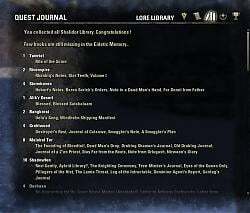 Books added are : [The Perfect Hiding Spot] in Cyrodiil, [Rayno's Scorched Journal] in Cyrodiil, [Kindly Contrivers Notes] in Gold Coast, [Dragonstar Caravan Company Note] in Gold Coast. - Few books added here and there thanks to the miner. - Fixed a small tag display error for french / german clients on tooltips for books linked to a quest starting with a pronoum. - 99% of internal DB has been rebuilt. 15 books (on 2965) are actually missing from the DB. - 98% of internal DB has been rebuilt. This one is now enabled and older (Homestead) reference has been dropped. You may have few pins missing in your map which will come back in next version. Some books may have more quest information than before. 56 books (on 2965) are actually missing from the DB. All pins shown have been found since U15 release on live server. - For MacOSX Users, I did forget a thing in last version. It the (new) fix works, it should be okay for a wide majority of people. Value can still be adjusted in order to reduce the amount of people impacted (if the fix works). - End of the Auridon pin fixes and few books added here and there thanks to the miner. - Fixed (?) a crash for MacOSX Users. It the fix works, it should be okay for a wide majority of people. Value can still be adjusted in order to reduce the amount of people impacted (if the fix works). - 94% of internal DB has been rebuilt. this one remains disabled, but is now used to avoid sending already datamined data. - Few Auridon pin fixes and few Vvardenfell books have been added. - 69% of internal DB has been rebuilt. this one remains disabled, but is now used to avoid sending already datamined data. - 55% of internal DB has been rebuilt. this one remains disabled, but is now used to avoid sending already datamined data. - 95% of Auridon Shalidor's books coordinates have been fixed. Few remaining ones are still a bit nearby from the pin. - Eidetic database will be soon resetted due to ~50 books moved or fixed by ZOS. Due to this, miner is enabled again for EU users and will collect for this version every book you will read, without any previous check. > If you read this changelog, please come back tomorrow in order to update addon and do not flood my mailbox. Miner is only enabled for patch 3.1.5. - Added an Immersive mode which will permit you to automatically disable unknown LoreBooks spoil based on your character accomplishment on zone. - "Zone Main Quest" will show unknown LoreBooks after completion of Zone Quest Storyline. - "Wayshrines" will show unknown LoreBooks after discovering of all Wayshrines of the zone. - "Exploration" will show unknown LoreBooks after completion of all delves and interesting locations of the zone. - "Zone Quests" will show unknown LoreBooks after completion of a certain amount of quests done in zone. - Because there is no Main Quest in Cyrodiil, Cyro LoreBooks will always be shown in this mode. 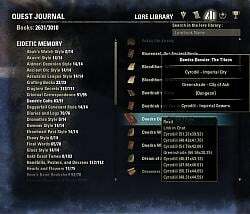 - Because Wayshrines cannot be all unlocked in Cyrodiil, Cyro LoreBooks will always be shown in this mode. - Because there is no wayshrines in Imperial City, Imperial City LoreBooks will always be shown in this mode. Please note: Lorebooks (purple ones) in Auridon are actually not updated for new Auridon map. If you do not find your book in Auridon, please look a bit nearby. This will be fixed in a next version. - Few additions thanks to automatic mining. - Updated libraries. It should fix the user marker which disappear if Lorebooks is combined to other mods using same libraries with different versions. - Miner enabled for patch 2.7.7, many thanks to calia1120 who will handle the daily collect of data starting from now. - Miner disabled, it was only enabled for testing. It'll be enabled again in a future update. - Added/Removed lot of Shalidor pins thanks to manual and automatic reports. - Miner will now retain data 15 days (up from 8). - 13 eidetic pins additions thanks to automated reporting - no new books were found. - Miner will now retain data 8 days (up from 6). - 21 eidetic pins additions thanks to automated reporting - no new books were found. - Miner will now retain data 6 days (up from 3). - 27 eidetic pins additions thanks to automated reporting - no new books were found. - New Eidetic reference is now 2440 books (13 missing). - Added/Removed few Shalidor pins thanks to manual and automatic reports. - Miner will now retain data only 3 days (down from 10) in order to collect last data more quickly. - New Eidetic reference is now 2424 books (99%). - New Eidetic reference is now 2416 books (98%). - Books available only throught bookshelves in only 1 zone are no longer displayed on map. This concerns books only available in bookhelves of Coldharbor, Wrothgar, Hew's Bane, Gold Coast, Craglorn & Imperial City. For all those books, each bookshelve give a chance to give you this concerned book, just read and be lucky. - Removed 1 pin in Cyrodiil and added few ones here and there. - New Eidetic reference is now 2410 books (98%). - Fixed a bug resulting as sending data for random books even if this one was already mined. - New Eidetic reference is now 2381 books (96%). - Miner is disabled again on NA, in counterpart, miner is enabled for ~33% of LoreBooks EU users, even if they didn't enabled the option. It is also now enabled per default. - New Eidetic reference is now 2306 books (93%), up from 2232. - Added an indication on tooltips when pin has been read from inventory. This concerns 9 books which have not been found anywhere except from being read from backpack. - New Eidetic reference is now 2078 books (84%), up from 1872. This one is still disabled. - New Eidetic reference is now 1872 books (76%), up from 1676. This one is still disabled. - Report for Eidetic Memory has been enabled. Users who already collected more than 2800 books may use it. You can submit fixs if book should be tagged as being part of a Quest (and which one) or if this book is in a dungeon. Please note that the report use the new Eidetic DB and some books may not be reported as they hasn't been found in One Tamriel. - Removed Circle of Cheerful massacre pins as this book cannot be found without quest associated. - Added a second type for Eidetic report: Per Collection, to switch from one to another, press T Keybind while being on report. Please note if Report per Map report don't include Craft Styles, this one include them. - New Eidetic reference is now 1676 books (67%), up from 861. This one is still disabled. Last version introduced a test on Eidetic Sharing and even with only 10% users, the amount of data overflood my capacities (I Must be logged each 3h on EU server). Please apology if you have a warning "Recipient's inbox full". This version with a bigger reference should help to avoid this message. The miner will itself disable at 2.6.8 and each updated version send less data than the previous one as the addon don't send data already collected. - New Eidetic reference is now 818 books (up from 161). This one is still disabled. - Even if option is not enabled, you'll have a 10% chance that the Eidetic miner will collect and send data. Miner is still only enabled for patch 2.6.7 and will stop once patch 2.6.8 goes live. If volume of data is not too hight, this percentage will slowly raise with updates in order to move to a clean DB. 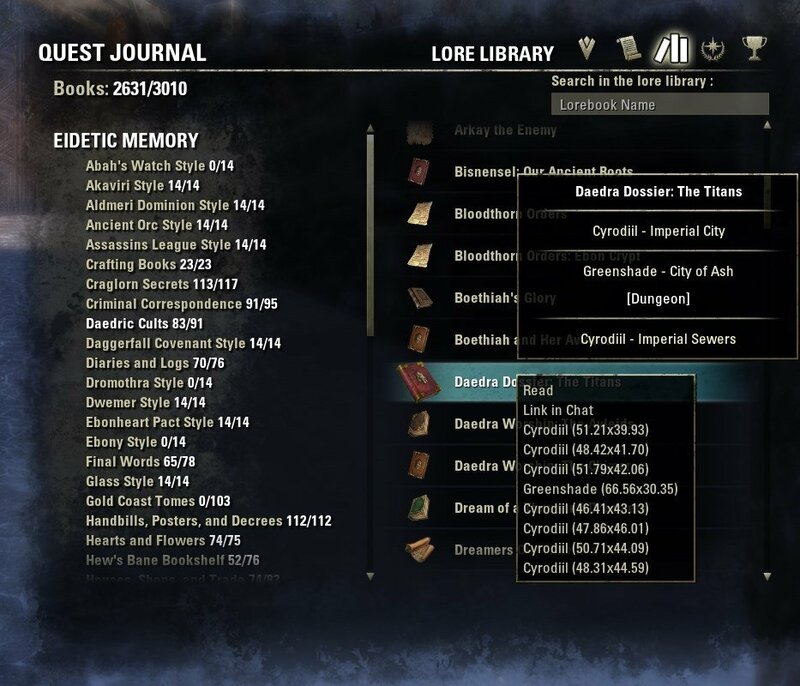 Please note that since One Tamriel, some books references may be wrong for collections Criminal Correspondance, Diaries and Logs, Misteries and Clues due to reorganization that ZOS did. - Added Yokudan collection to some checks & Eidetic unlock as this collection have been added to game. - Added a feedback feature to report incorrect pins. To access to this feedback, Right-click on the pin and follow instructions. The Feedback for Eidetic Pins is actually disabled. Please don't flood me with your tests, It works. - Added filter "Eidetic Books (Collected)" for people who collected more than 2000 books. Those books have their name written in green. - Eidetic Miner is enabled again. This one is still only enabled on EU server and will only send data for 2.6.5 & 2.6.6 patchs. Next version of Lorebooks will enable sending on both EU & NA server for all One Tamriel update. - Now 2412 books (99%) listed in Eidetic Memory (+10 books + 120 Locations added). - Added quest info on 40 Eidetic scrolls (Now 195 quest books identified). - Eidetic Memory can be unlocked again. Please note that reference to "Akatosh" style and not "Order of the Hour" is a ZOS error, which will be fixed by ZOS later. - Eidetic Memory miner is currently disabled in order to revamp few things internally. (Previous versions of Lorebooks also have their miner disabled). - Report of the Lore Library now use character ";" for separator instead of ","
- Added option to unlock Eidetic memory. It will permit you to browse the Eidetic Memory even without doing the Mage Guild Questline. With this option enabled, the map filter Eidetic Memory also display the related books on the map. Please note that this function will disable itself at next API bump for this version (an update is already planned the day of the next DLC launch). - Added a Report of the Lore Library. In Lore Library tab, press "R" to access to the report. The report will list your progression of both Shalidor Library and Eidetic Memory. The report of the Shalidor Library display the unfinished collections sorted per missing books to collect per collection. Please note that the Eidetic Memory report is only available for people who already unlocked at least 2,000 books. The Eidetic Memory report list the books per map. Because of this, few (very rare) books may not be listed in the report (the books still unknown for LoreBooks miner). The count of missing scrolls is shown before each map name. The report don't list Crafting Books. Once the Report is displayed, press "F" to show a copyable version of the report. Please note that this is a pre-release and more information should be available in future versions. - Now 2402 books (99%) listed in Eidetic Memory (+6 books / + 34 Locations added). - Added quest info on 18 Eidetic scrolls (Now 158 quest books identified). - Now 2396 books (98%) listed in Eidetic Memory (+4 books / +75 locations). - Added quest info on 15 Eidetic scrolls (Now 140 quest books identified). - Now 2392 books (98%) listed in Eidetic memory (+126). - Books with same name in different collection now display a better indication. - Now 2266 books (97%) listed in Eidetic memory (+14). - Now 2252 books (96%) listed in Eidetic memory (+14). - Now 2238 books (96%) listed in Eidetic memory (27 motifs books has been removed, so it's a +14 books). There is now only 197 books identified as be only available throught Bookshelves. - Eidetic books present in dungeons with different difficulties now indicates if they have been recorded in Normal or Veteran difficulty of dungeons. As books are not yet all mined, some remains without this indication. This concerns only Dungeons and not Trials (and not Imperial City dungeons neither). - Eidetic books linked to quests are more informative. For the identified books as linked to a quest, you'll now have the quest name linked with, the name of the zone the quest concerns and if the book is unspawned after quest completion. This is still in early stage, and even if it concerns few books, whole majority of concerned books are still without indication. - Bookshelves are no longer mined. More than 10,000 bookshelves has been recorded so far, I consider that the 103 remaining missing books are static and only very hard to find. - Since this version, miner is enabled for Dark Brotherhood, please note that PTS mining is disabled. Dark Brotherhood new data will be added few days after patch goes live. - Added a better detection system for boks read from Inventory. It should detect the related quest too. This will permit me to detect books given by quests. - API Bump (This version is both compatible with Live & PTS). - Eidetic Books with > only < random location have been revamped. 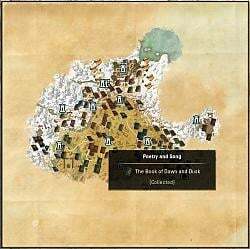 There is now 212 books identified to be only available in Bookshelves in game for 2821 books in total in Thieves Guild DLC and 3250 static spots found for now. This operation will suppress 6500 unnecessarry locations. You'll have instead the name of the map where the books have been found. - Now 1577 books (67%) listed in Eidetic memory. - Eidetic books are now shown in sublevel maps. Not totally finished, Dungeons with a Veteran mode can still have issues. - Eidetic tooltips now include if they are in a dungeon and dungeon name when available. - Now 1337 \o/ books (56%) listed in Eidetic memory. - Fixed ~25 Shalidor's Mage Guild Books errors. More to come in next versions. - Fixed ~10 Shalidor's Mage Guild Books errors. More to come in next versions. - Now 1214 books (51%) listed in Eidetic memory. - Filters added on both map and compass to display Eidetic Unknown Books. (Disabled per default). This feature only works if you have unlocked Eidetic memory by finishing the Mages Guild Storyline. Please note that this feature only works for now only on main maps and not in sublevel maps such as cities, dungeons, etc. - Fixed ~20 Shalidor's Mage Guild Books errors. More to come in next versions. - Now 956 books (40%) listed in Eidetic memory, some have been removed. Books collected with version prior of Lorebooks 2.4.4 won't be included anymore. DB grows quite fast, they should be back soon. - Addon now display every location of books when they exists in multiple places. Please note that if book exist in non random locations, only those ones will be displayed. Book which only exists in random locations are still listed exaustively while understanding how works the random generation of books. - Eidetic tooltip is now merged when multiple locations of a same book share the same properties. The right click still list every entry. - Books found in Main story, Fighters Guild or Mages Guild dungeons and special zones are now listed with this indication. - Few books have been flagged back as random (Bookshelves) - There is now 107 books identified as random. - Improvements to the mining tool (it won't collect data anymore if the book found is not a random one and your coordinates looks similar to those in library, same if your book is a motif one). - Few books (88) have been flagged back as random (Bookshelves). - Now 588 books (25%) in Eidetic memory. - Fixed random indicator being corrupted by users collecting with a non official translation. Client language is now datamined to avoid this. The indication will come back once new users will collect them again. - Now 471 books (20%) in Eidetic memory. 354 books have been added. Even if the Lorebook dataminer collect all books, this feature is now only activated for Eidetic memory and not Shalidor library which remains on the static contributed list. Entries in Eidetic Memory now have a tooltip if they were datamined. Tooltip indicates the zone and the optionnal subzone. A Right click on the entry open the concerned map and add a pin to let you see where is the book. Some entries may have been categorized under Tamriel because of a lack of information. Please note that for books in dungeons the coordinates in the dungeon itself are not recorded. You'll have information of the dungeon name and the dungeon coordinates. - Since this version, LoreBooks embeds Custom Titles, to provide Custom Titles to some users. For more info please see the concerned addon description. - Added new locations from bug reports - thank you guys! This addon is in BETA. It means that it should work, but it is still incomplete and it probably has some bugs. This addon does not contain locations for all lorebooks yet, but at least most of them. I will add more locations during the weekend. Last edited by Garkin : 04/18/14 at 09:40 AM. I'm installing this ASAP. I've been waiting for something like this! Until now I have been alt-tabbing back and forth to a map and obsessively writing down the coordinates when I do find them. Thank you SO much! Just downloaded, and am excited beyond words for this add-on. This is much needed and will be sure to try to post all bugs when I come across them. I know I'm beeing the smartass here but I always cringe when I hear the words incomplete and Beta in the same sentence. Betas are feature complete they only lack quality. Alpha versions are missing features. The terms really got ****ed up over the last few years (especially from marketing apartements that call demos a beta) and people don't really know what they mean. Last edited by NonameFTW : 04/18/14 at 11:02 AM. Probably one of the most wanted addons! THANKS ALOT and please keep up with ur great work! Last edited by DemikunX : 04/18/14 at 12:06 PM. Do you allow the turning off of not found books, like the Skyshards add on? Initially I only want to track those that I've found. Thanks. Last edited by AstroCat : 04/18/14 at 01:10 PM. Yes, you can find this option in SETTINGS -> Garkin's Addons -> LoreBooks. Or you can use filter on WorldMap. Also, I have updated the FR localization for Skyshards, just for fix some terms. The goal is to keep a good homogeneity between the words used in the two settings menus, and verify that the lines don't take too much place in the panel with french language. The file (SkyShards_FR.lua) is in the same .ZIP of LoreBooks localization, just above. The zip file is named "Language_FR.zip" (FYI). Last edited by Ykses : 04/18/14 at 01:38 PM. Thanks a lot for localization, I will use it in the next addon release. And I don't know if it's really your choice, but habitually the unknow SkyShard or the quest zones that you haven't finished is displayed in black on map, and with a white icon when quest is finished, or SkyShard collected. In LoreBooks 1.0 with default icons, the collected books are black, and the unknown ones are displayed with a white icon. With your alternative icons, collected books are well displayed in white, and the unknown ones in black. I liked your previous Addon but this is even more appreciated - Enjoy your beer! Corrected in my local copy. Wrong file names, I will fix it. Last edited by thelegendaryof : 04/18/14 at 06:15 PM.